My dog knows it's not bacon. He won't eat them. My dog won't eat these for anything. They seem a bit too hard and not 'chewy' enough. My dog likes either soft or hard treats... she doesn't like rubbery ones, and that is what these are. Not the best treat in the world my girl definitely likes them. Beggin strips always get my little dogs attention. She loves them. 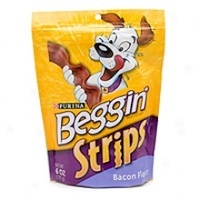 You know that saying will work for or whatever for.... Well my dog will do just about anything for Beggin Strips and she absolutely loves these treats above and beyond any others I've tried with her!!! I have never given these to a dog that didn't like them! All of my dogs have enjoyed these treats. I don't feel like it's a great snack; not much nutritional value and not for dogs with weight issues. But she does like them. The smell to me is unbearable. 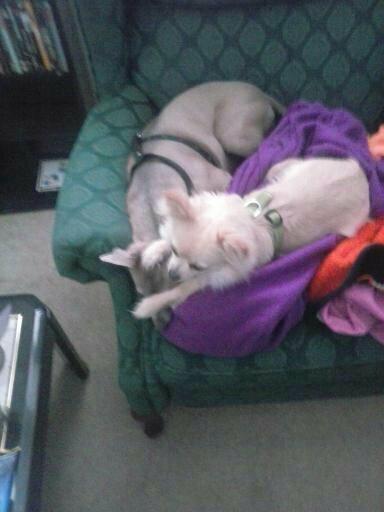 Puppy won't even touch them. My dogs love these. I have a Pomeranian and a poodle mix. The Pomeranian LOVES the flavor and the chewiness. The poodle requires that her treat be broken up into small bites but she will gobble these up also. I can't imagine that they're really healthy---just as real bacon is not especially healthy for humans---but an occasional treat is fine. My dog is madly in love with these treats. They don't smell like bacon, really...and I assume they don't taste like actual bacon. But, she begs for them and will do most any trick to get them - every day! Anyone who feeds these to their dogs obviously doesn't care about their well-being. This treat has absolutely no nutritional value, is made with by-products, and has had too many recalls. It's equivalent to garbage.